I did something fun on this card! I wanted something under the pumpkins and I tried to think what would be good. We were having fresh sweet corn for supper so as I was "silking it" it dawned on me that this would be a perfect base for the pumpkins. I colored it with distressed ink to darken it and tucked it under the pumpkins. What do you think???? to make this background. It was so easy too. I simply put distressed ink on the stamp using my brayer and then I laid the paper on top of the stamp. No need to buy lots of pattern paper when you can stamp it in any color! So fun! 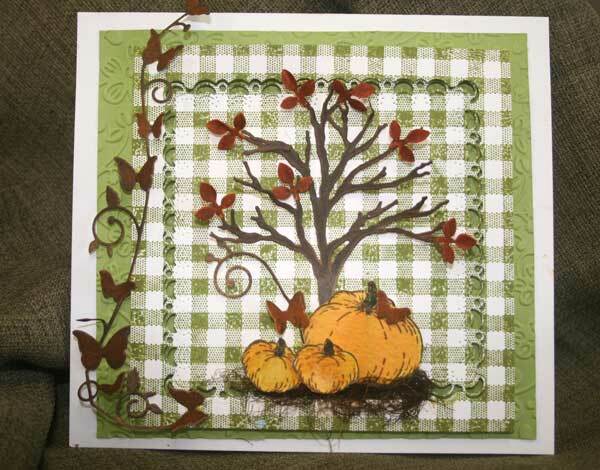 After the stamped image dried, I cut it out using the new Stacker Frames by Cheery Lynn. Then I popped up the inside and then doubled the tape to pop up the out side edge for dimension. It doesn't show up the best in the picture, but it really makes it look like it is framing the inside. I used Tim Holtz Water Brush and distressed inks to color the pumpkins, and the tree, leaves and butterflies were inked with Wendy's new Archival inks which I love. The dark brown is the best I have found. I embossed the solid green card stock with 6x6 Floral Frenzy Embossing Folder for added texture. Gotta love those 6x6 and 8x8 embossing folders. You will have until next Thursday, September 5 morning 6:00 AM EST to link your project. A winner will be chosen from a random drawing for week #35 the winner of the challenge will be announced Friday, September 6. This week's winner will receive a Embossing Folder. The winner will also be entered in the 2013 end of the year $100 gift certificate drawing. 3. Or if you are posting to the SCS gallery, you will need to use a special code to tag your card to the challenge. This week's code is joansgardens, JG0829 and needs to be posted with the challenge. Please enter both on the same line with a comma between as I have shown. 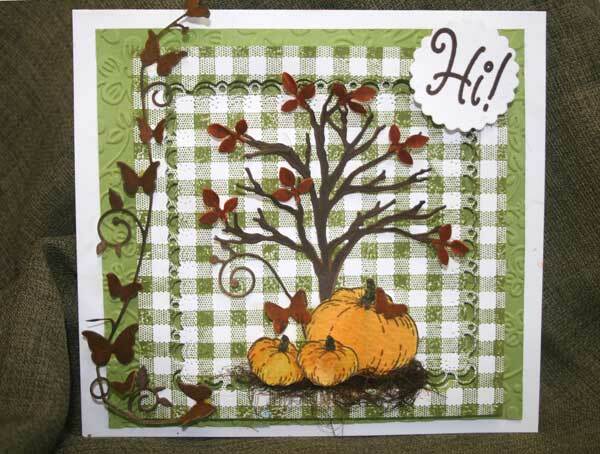 LOVE this card creation Joan! What a FABULOUS idea to use the corn silks for around your pumpkins ... genius I say and quite fitting!! I too love gingham and yours looks just like the country place mats I have ... well done! A truly inspiring creation and I can't wait to play along! Happy holiday weekend to you!! 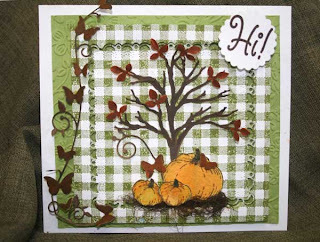 Awesome card, perfect fall card like the gingham idea and I think something real from nature makes it so much more realistic looking. I like making cards using some real embellishments. You card is very cool. Corn silks how smart is that. Fabulous Fall creation. I love the corn silk idea. Our crafty minds are always working, aren't they? LOL Your gingham background looks awesome. Great card and love the silks. It's beautiful ! The silks look great. What a great idea. Also, love the gingham. It pulls everything together beautifully. Your a genius ! You go girl, completely blown away with the corn silk, great idea, I love the gingham DP, I'm a nut for gingham and dots. Great fall card. I am really glad to see you design and playing again. 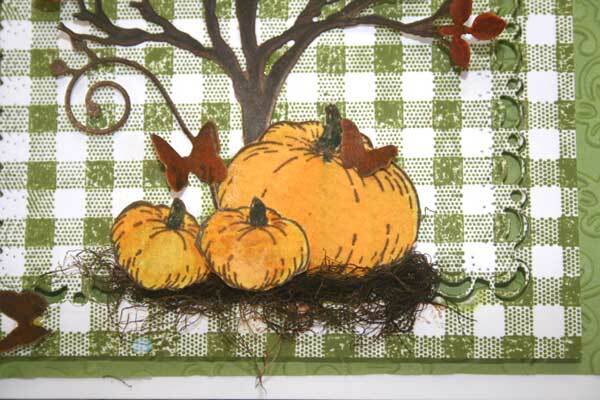 Joan, your card is awesome, love how you made use of the corn silk, so very inventive!! I too love gingham and that stamp from IO, is wonderful, I could never find the color gingham I wanted so I got this stamp some time ago and love it. Love all your little touches. Great fall card..love the corn silk idea. Thanks for the paper pad. Great inspiration - and great entries as well.